For Paws does not currently have a offical webpage. We put this page together for reference if anyone was interested. 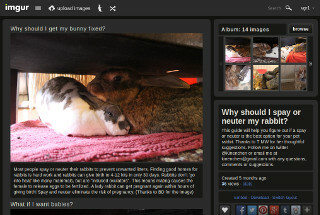 "Low cost spay and neuter of dogs, cats, rabbits and rats. Vaccinations and microchip available at time of spay/neuter only. Call for CURRENT prices & times! We are a 501(c)3 non-profit currently open most Mondays, Tuesdays and Thursdays (appointment required). Check-in between 9 and 10am, go home time usually between 4 and 6pm. ALL DOGS go home with pain medication, e-collar/cone is extra. CASH payment due at time of pick up. All dogs must be on a leash, tame cats in carriers, feral cats in traps, and rabbits and rats in carrier or container. By appointment: Monday & Wednesday 9am – 6pm - Call for latest information, hours, and appointments. For Paws does not prescribe pain medication for rabbits. When I asked about this I was told that only older rabbits may need it. You should talk to your rabbit savvy vet for pain meds before the spay or neuter operation for any age rabbit! Make sure to give BID (twice a day) at a modern dose!! There is a study that shows that giving Metacam post-op (spay/neuter) will help recovery times decrease by almost 1 day with females and a bit over 1/2 a day with males. Metacam can also help reduce swelling and inflammation, helping prevent possible adhesions. This can be key for females because after the OHV (ovariohysterectomy) adhesions between the uterus (and other internal parts) and GI tract, can make the normal peristalsis movements abnormal. Normally this does not show up right away. The reason that some vets give for not using Metacam is that it's an extralabel use for rabbits. They will point to FDA's 21CFR530.3, this is the U.S.'s FDA CFR (Code of Federal Regulations), title 21, chapter I, part 530 (extralabel drug use in animals), subpart A, section 530.3, ". . . use in species not listed in the labeling . . ."
There are many studies that show Metacam is safe to use in rabbits. Page © 2014-2019 RCR. Page hits: 11364 since December 1st, 2014.